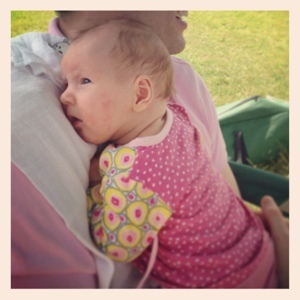 Life and Times of Mummy Morkus: The Week That Was Instagramed! 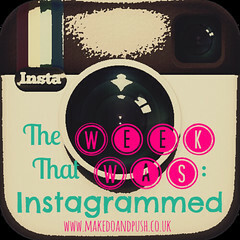 The Week That Was Instagramed! 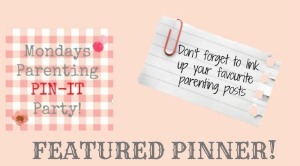 My first linked up post linking with Make Do and Push a blog I enjoyed reading before L was here and continue to enjoy now. The ideas for this blog have been circling since I came out of the post delivery fog 4 weeks ago. I wanted something else to do with my time while L was napping and to record and share some of our time together. 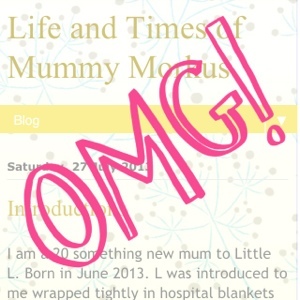 I join an extensive collection of blogging mums out there and hope that I can write some things that others would like to read and share. The weekends are usually very busy for us but thankfully this was a weekend for just the three of us. It is so nice to catch this time together and enjoy being a small family. New skills and fluffy post! One of the best things about being a teacher is seeing children learn, the sense of achievement is written all over their faces and it makes me swell with pride for having been able to facilitate that. Now as a mother helping my own child learn is so much more rewarding, so far we have had recognition, smiles, sticking out tongues and most recently very determined batting of floating objects! These small milestones have come in such a short time , I can not wait to flex my mother/teacher skills and help L learn some more. 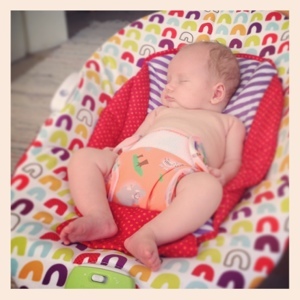 Also today I received some new cloth nappies in the post! I love new nappies, the soft fleece, the exciting colours and in this parcel the closer step to swimming! The swim nappy is in an appropriately royal print The Kate and I can not wait for L to flash it at the local swimming baths. Look put for our review of it in the coming weeks. Temperature. Such a taxing topic recently. All pregnancy everyone was raving about how lovely a summer baby would be, the walks, the light evenings the not so cold night feeds. No one talked about dealing with a heat wave and how the soaring temperature would send my contented new born into a frenzy of eating and discontent. 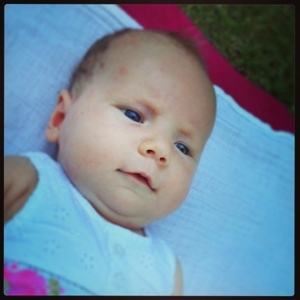 Today was milder thankfully but my little pickle had a temperature all of her own. Not high, nothing higher than 38.7 but high enough for a worried first time mum. 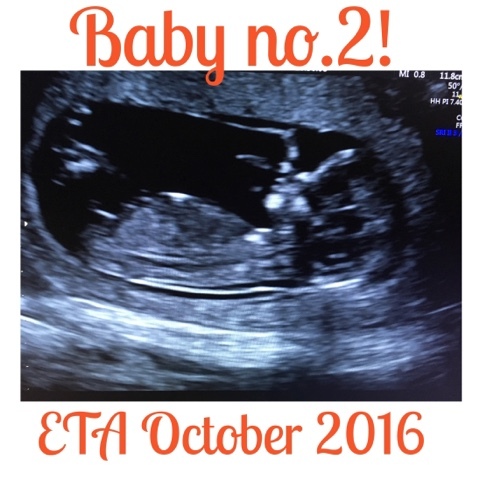 I was on the phone to my own mum, also a nurse, I was asking for advice from my birth group and I sat watching her sleep worried that she was clammy and that my thermometer was too variable in its readings. Thankfully after a tepid water wash down L woke a bit happier and more herself. God save me when she is actually sick for the first time! Wednesday is NCT Ladies Who Lunch Day! I have been so lucky to meet a great group of like minded women all with babies the same age as L. The shared experiences and late night emails have been a life line when I have been at my lowest points post section. Getting out every Wednesday to do a simple thing such as eating in the pub is priceless. 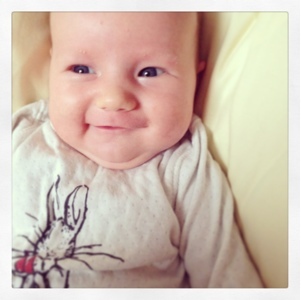 As are L's cheeky smiles, in Peter Rabbit baby Gap. Lush. I spent my pregnancy dodging infections from the children in my class. Scarlet fever. Slapped cheek. Even the common cold. So protecting my child from any disease and illness that I can is really important. TB in London is on the come back, my Granddad had TB as a teenager and was in and out of a TB hospital right up until he was a young adult about to marry my Nanny. So off I went with L to get her BCG, the injection I had as a teenager, to protect her against this horrible infection. Needless to say L did not enjoy the experience! Neither did Mummy Morkus, but injections are one of life's unfortunate necessities so I won't apologise for the temporary pain. I did however buy L some new toys because she was so brave. Her new found skills with her hands has prompted me to look in her toy box ... It is stuffed full of stuffed animals, nice to hug but not necessarily best for development. Some new light rattles and textured links from ELC will hopefully redress the balance. We did play time in the garden today and L mostly ignored the new purchases and watched the trees! 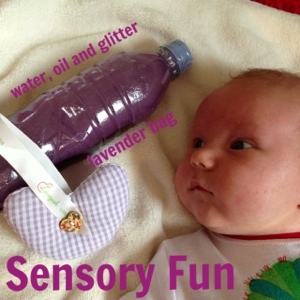 Baby sensory fun today, see my blog post. And some lovely post through the door. 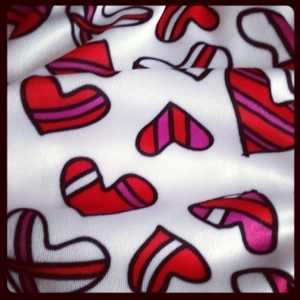 A new feeding scarf from Loveyush, look out for the review next week. It was also another hot hot day and L decided to sleep all afternoon. I even went so far as to undress her while she slept to wake her up, but no. Sleeping soundly in her nappy is the only way to bounce. All the sleeping did however give Mummy Morkus a chance to recharge her batteries which had been depleting during the week. Very much looking forward to the weekend and Daddy Morkus being able to take over some what in the baby care. A family picnic in the sunshine! Hainult Forest is a favourite of the Morkus family of old but this was Mummy Morkus and L's first trip. We packed the hamper and set off for the forest picking up the other member of the Morkus clan on the way. It is lovely to get out and do things with family. The sunshine certainly helps this. I love the weekends with Daddy Morkus, he is able to take over between feeds and I can sit back and watch my two favourite people in the world. Tomorrow is our one year wedding anniversary, more on that next week. Lyra is such a cutie! 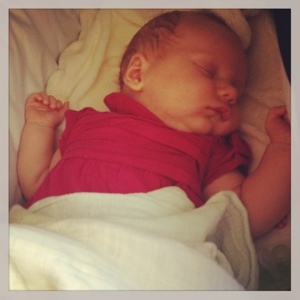 I feel broody just looking at her newborn-ness. Enjoy it - it doesn't last for long. Happy Wedding Anniversary for tomorrow!! Wow, your blog is crazy new! 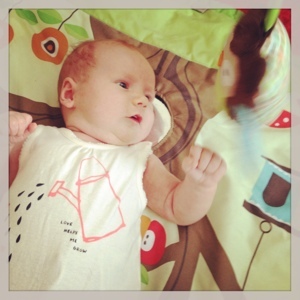 Injections are never fun for our little ones, but new toys do make everything better.